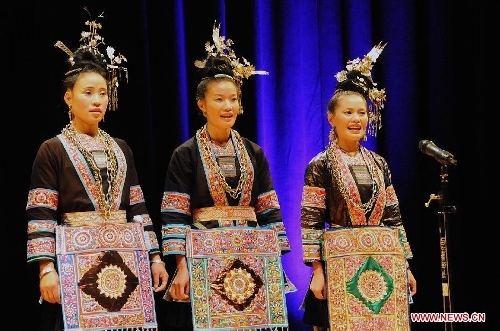 A dozen of villagers from China's Dong ethnic group performed their indigenous folk chorus Thursday, bringing the UNESCO-listed cultural heritage to a foreign audience ready to appreciate the thousand-year-old tradition. A team of 14 villagers from China's Guizhou Province made their debut at the Asian Society's Texas center in downtown Houston. The show, performed by seven adult singers and seven children, was comprised of a score of solo and choral songs. The choirs, wearing dazzling ornaments and exotic dress, captured the hearts of their American audience instantly. Cheers and applause did not cease until the show came to an end. Katie Sanders, 45, housewife and mother of three, marvelled at the songs, despite not understanding the lyrics: "It's amazing. I don't know what they are singing, but it's so touching and natural. It just goes straight into your heart." Songs covering a wide range of subject matters including, such as greeting guests, harvesting and courting, were performed. Wu Zhangshi, captain of the team and the deputy director of a Dong museum, told Xinhua the Dong people, numbered 2 million, wanted to showcase their own culture to the outside world by singing their traditional songs. "We feel very excited to have the opportunity to sing to American friends and let them know our ethnic culture," Wu said. Dong folk singing was recognized by UNESCO as an Intangible Cultural Heritage in 2009 and has been performed abroad since 1986. The folk tradition is a history of Dong people, as they don't have a written version of their own language and recorded literally everything -- from clan history and legends to societal rites and social duties -- in a variety of song types. Dong people live mostly in China's southern Guizhou and Hunan provinces as well as Guangxi Zhuang Autonomous Region. According to historical records, the Dong music originated in the Spring and Autumn Period and has a history of more than 2,500 years. This choral musical tradition is a natural form of folk music, featuring multi-part, a cappella harmonies with no conductor. Dong choirs with more than five people are led by one singer, who is backed by a multi-part harmonic chorus. The music belongs to a tradition of voice polyphony songs, which is extremely rare in both Chinese and world folk music. Dong music is uniquely inspired by and imitates the sounds of nature, such as insects, birds, mountains and steams. Its themes reference nature, labor, love, friendship, and are performed as a beautiful harmony between people and nature. Deputy Consul General of the Chinese Consulate in Houston, Li Guixi, told Xinhua he hoped the show would be conducive to cultural exchange and contact between people of the two countries and to enhancing bilateral relations. The chairman of the Asia Society's Texas center, Charles Foster, said he hoped Houston could hold more such events in the future to bolster exchanges between the two countries. The choirs, invited by the Smithsonian Institution and the Asia Society, are expected to stage two more performances at the 2013 Smithsonian Folklife Festival and the John F. Kennedy Center for the Performing Arts in Washington D.C. during the tour.